I know, you just have 8 seconds to spare, but if you are serious about lowering you BI costs, and maybe switch from Qlik, Tableau or Microsoft BI because of cost, or because you need real-time, you should continue to read. We have on average a 70% lower TCO (Total Cost of Ownership) than any of the other systems, mainly due to much shorter implementation time, cheaper license fees and an overall simpler system. You should really try it out! Business people can actually create their own dashboards without the help from IT. This will save you tons of work. Yes, they need to get familiar with the web-app, and that takes somewhere from 5 – 15 minutes of supervised training. If this sounds interesting, please read on, spend more than 8 seconds, and don’t miss our documentation section. If you need help, we’re just an email away. Send it to hello@digrealtime.com. We’re made in Sweden, the land of Skype, Spotify and Ikea. Collect and combine data from many data sources in one place. Tools included for ETL, Direct Polling and Streaming. Connect anything. Analyze anything. 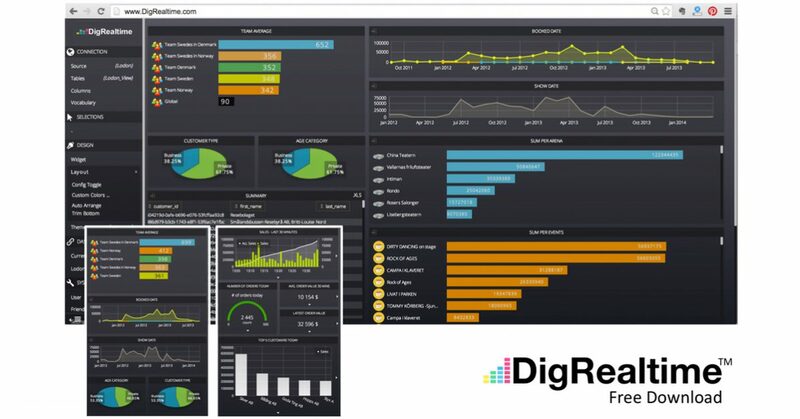 Build and deploy real-time interactive dashboards in matter of minutes. Drag-and-drop widgets. Aggregate data directly in the dashboard. Allow your users to build their own dashboards from scratch, or tweak your templates, while you stay in control of governance. Run in our cloud, or install on your own servers. Are you busy collecting reports from every corner of your organization, just to get on top of things? We can fix that for you! Are you struggling delivering decision-friendly financial data in time to executives who need to make smart decisions every day? Is your organization struggling with endless report requests from business users? Are your reporting services falling apart, taking too much time? Crush quotas with insights and detailed data from the whole sales process in context with metrics from other parts of your organization. How soon do you know if your campaigns work? How soon do you know the bottom-line results of your campaigns? Serve your customers faster by knowing everything about them, and their case, before they even contact you. Our Basic Server Edition is free. All dashboard- and report features included. Ask someone from your IT department to download our server software and set it up for you. Want us to set up the system for you on your servers? If you don’t have the time to read manuals, install the software on your servers, set up the data extraction pipelines and build the first set of dashboards, we are happy to help. For a fixed price, we will get you up and running in no time. The price is the same for the Free Basic Edition and the Pro Edition. The Free Basic edition has the same features as the Pro edition, except for enterprise rights management and Active Directory integration. Get The Free Basic Server Edition.